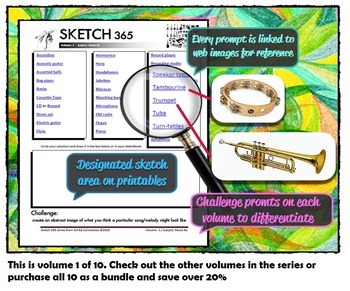 Sketch 365 is a series of interactive lists that provide students with options of things to sketch in daily sketchbook assignments or in any other ways a teacher wishes to implement them. 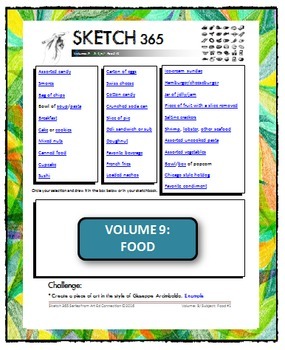 Each list contains 31 unique items that are not duplicated on any other volume/list of the Sketch 365 series. The lists can be distributed to students in printable form or distributed to students digitally. Each item on each list is linked to web based images which can serve as inspiration and/or references as students complete their drawing. I use this daily. Not only does it serve as valuable practice, it is an activity that students can do routinely and autonomously as they enter the classroom. Great daily starter/Entrance Activity! Please note: Web content is ever changing. To ensure content is classroom appropriate check to be sure your internet browser's filter and/or Google "SafeSearch" is enabled. Be the first to here about our new resources, SALES, and giveaways! Sign up for our e-update.